This is such an easy, effective project with something you probably have on hand – coffee filters. You can make it simple or harder depending on the age of your crafter. To begin, turn the coffee filter inside out to put the seams on the interior. 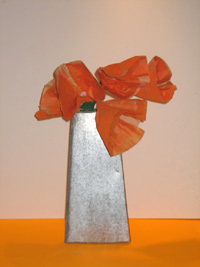 We sponge painted ours orange because the shape reminded us of wild California poppies. This was our interpretation, get creative and paint your own version, perhaps using some of the paint techniques in our craft section. After your flower has dried, poke a hole in the bottom with a sharp pencil. Run a pipe cleaner through the hole bending the end to make a small loop for the stamen. Cut off a section of the pipe cleaner at the bottom and wrap it around the base of your flower to scrunch it together. If you want to get more elaborate, cut tissue paper a little smaller than the coffee filter and loosely glue it inside the flower. Wrap the pipe cleaner in green crepe paper, gluing both ends. Add a small leaf cut from the crepe paper gluing it to the stem.